Around 7 homes every minute suffer a break-in. The stress and upheaval provoked by burglaries exacerbates the loss of property or damage caused. It’s understandable you’d want to protect your home. There are plenty of home security apps available to help. But what about investing in hardware, specifically smart door locks? With a raft of features, they could be the key to solving your security problems. Read on to discover the best smart door locks for 2018. Some smart home users like buying products that work with their existing eco-system. So if you use Samsung for other devices, you might want a Samsung smart lock. The door lock pairs with smartphones via Bluetooth. You don’t need a password or key to gain access; just the phone. That’s helpful if you have guests and you don’t want to get extra keys cut. Enable family-arrival notices and get push alerts when your child gets home safely. Buy one for your parents and keep a discreet eye on them from a distance. 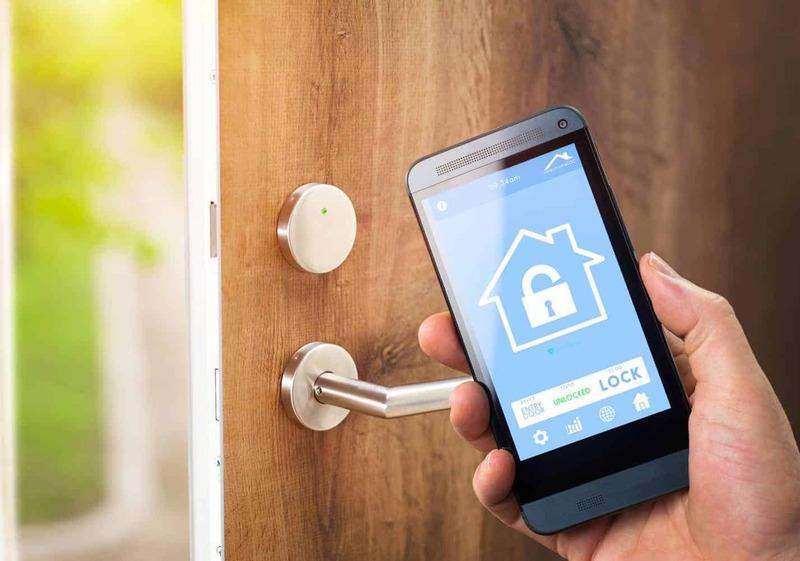 The second generation version of this smart lock continues to prove popular with homeowners. Both secure and convenient, it’s also fast to use. Just tap the outer house with your finger to open the lock. It uses an authentication system based on Bluetooth to check you’re allowed access. For the more traditional homeowner, you can still use standard keys. They also provide wireless fobs or you can use their smartphone app. Kwikset has the advantage of having manufactured locks for over sixty years. If you don’t like using smartphone apps, consider code door locks. This offering by Schlage lets you, or a guest, tap in a code. If the battery runs out, just use a regular key to get in. It also has an ANSI Grade 1 rating, the highest available. Its only downside is that you’ll need a Z-Wave hub if you want to connect it to a smartphone or other devices. If you don’t, it’s more of a wireless deadbolt. This offering comes from another big name in door lock security. With its easy-to-use controls, it even speaks three languages. It’s easier to slot into an existing smart home ecosystem since its compatible with these home control systems. Simply tap in your code and unlock the door. It doesn’t offer features like Bluetooth recognition but it’s a great place to start with smart door locks. For Apple users, you might like this HomeKit-enabled smart lock. It also works with Nest and Logitech products. While it’s not compatible with all of the deadbolts on the market, it’s easy to install. One of the more reliable smart door locks available, it’s a durable offering that lets you retrofit existing deadbolts with smart technology. Any of these smart door locks can help you gain peace of mind when leaving your home. Pair them with a smart doorbell for an extra layer of security. Has this whetted your appetite for more fantastic smart solutions? Check out our blog to stay up to date with all of the latest news about smart home automation.